It’s that time of the year again, the Spring racing carnival, with the pinnacle event – Melbourne Cup – scheduled for the first Tuesday in November. Are you looking for some ideas on what to wear to Melbourne Cup? This post looks at some really affordable options for race day with dresses all priced at under $80. Whether you are off to the races, part of a champagne lunch party, or attending a special event function; a stylish maxi like this Toby Heart Ginger satin dress is the perfect choice for race day. With understated elegance, accessorise with jewellery and headwear to add your individual touch. Looking for an outfit with a little edge? 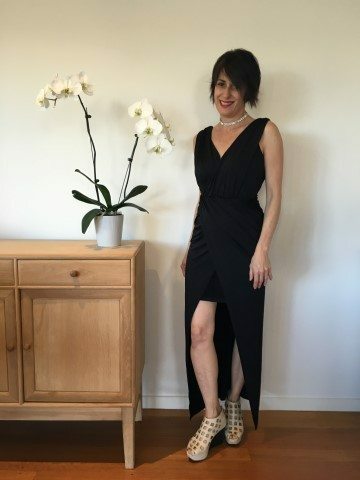 This black Mia Clothing formal maxi dress is a sensational little black dress with a twist. Pair with your favourite stilettos or platforms and you are good to go. What about a gorgeous grey marle maxi for something different? In a neutral colour with a fabulous braid back feature, change the look by adding black, white or metallic accessories and make a statement! Thinking of a more casual affair for Melbourne Cup day? Check out more maxi dress options in pretty floral fabrics and boho chic designs. Don’t forget that special events like Melbourne Cup are also about having fun. Be bold in bright colours like this dazzling Toby Heart Ginger Red Polly Dress. Looking fabulous doesn’t mean that you have to break the bank either. This Passion Fusion strapless red dress is a stunning outfit, perfect for Melbourne Cup and is priced under $20! Classic black never goes out of style. Take your pick from a conservative knit, strapless little black dress, or a more daring sheer black set. You can accessorise as much as you like on Melbourne Cup day and the Spring Carnival season. Stay firm with this monotone theme with black shoes and accessories, or splash out with statement gold or silver jewellery. If you are planning a day at the races for Mellbourne Cup, invest in a beautiful hat, fascinator or head piece. View some beautiful pieces by Melbourne-based milliner, Melissa Jackson, for some stylish inspiration. Derby Day (Saturday before Melbourne Cup): Traditional black and white is the order of the day. Classic cuts, pencil skirts and cocktail dresses in monochrome or classic black and white palette. Melbourne Cup Day (first Tuesday in November): It’s the pinnacle event of the Spring Carnival full of bold, colourful fashion, statement pieces and exquisite headwear. Oaks Day (Thursday after Melbourne Cup): Alternatively known as Ladies Day, this event is all about pretty dresses, flowy fabrics and gorgeous delicate styling. Stakes Day (Saturday after Melbourne Cup): Also known as family day. Feel free to take a more relaxed approach to dressing for this event. It’s the perfect day to wear a pretty floral dress or tailored trousers and soft blouse. Melbourne Cup can be celebrated in lots of different ways. What to wear for Melbourne Cup depends on how you want to spend the day. It may be a day at the races, a casual BBQ, or lunch with the girls. Read this post for more fashion tips and ideas for affordable Melbourne Cup dressing.